We had to put on our thinking caps to make this one work. You see, it's not just us who are normally closed on Thanksgiving, but many, if not all, of our vendors are, too. That means none of our regular deliveries will be showing up here tomorrow: no fresh bread, baked goods, produce, etc. That means we had to come up with a menu that worked with what we had on hand and what we could pick up and prepare today. Not only that, but we gave our employees the day off tomorrow so it's going to be me, Evan, and Momma all day, and thankfully Colin and Dekin have agreed to come in for 1/2 shifts. So please be patient with us, we'll be doing our best with what we got. And most importantly, please remember that this is all for a very good cause. 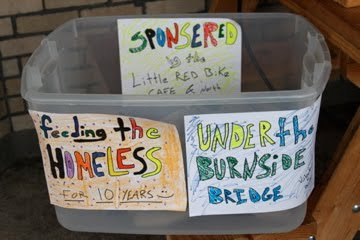 And please don't forget: we are collecting donations tomorrow for our "Under the Burnside Bridge" Thanksgiving project. Please bring coats, hats, scarves, jackets, gloves, and other cool-weather items to the cafe tomorrow. All items will be passed out (along with a hot meal) to Portland's homeless, beneath the Burnside bridge tomorrow night, courtesy of our friends Venus and River. In addition to the clothing drive, we will be donating our proceeds from tomorrow's shift towards Venus' cause. Please come help support this very important and selfless act on behalf of our friends. that's actually a pretty extensive menu! don and lola will be by tomorrow morning for some coffee before they help out with a turkey drop... happy thanksgiving to you all! i want to thank you all for a wonderful breakfast, a warm space to enjoy ourselves and for giving isaiah and i an hour away from our own sadness and loss that we've been dealing with. thank you, thank you, thank you! happy thanksgiving once again!